When I was a defense contractor outside of Boston, I found one of the guys I worked with was a scuba diver. I was certified as well, so we decided to plan diving trips after work during the summer. Word got around and we added one more member to our little band of brothers. Mark and I were fairly novice divers, but our third friend, Art was a dive master and had thousands of dives under his belt. That first time out we chose to go to Cathedral Rocks in Gloucester Massachusetts. 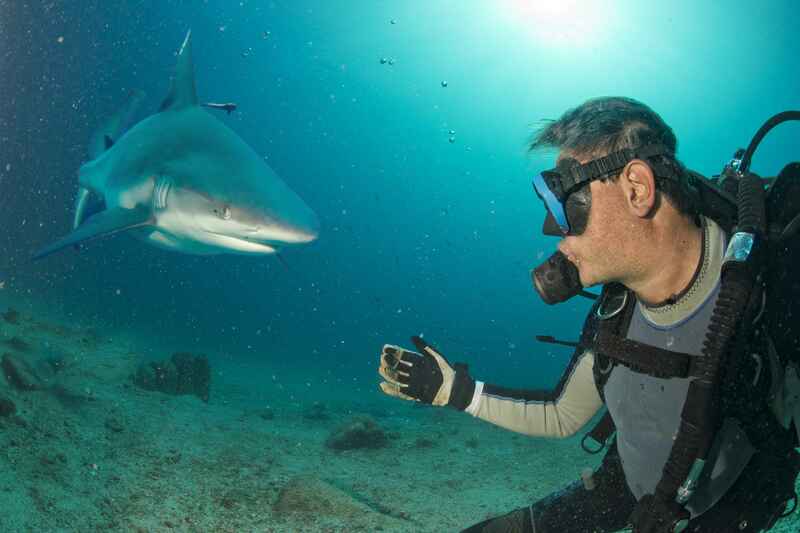 As we were suiting up Mark and I came upon the question of sharks, and what to do if we encounter one. Art laughed “I don’t have to outswim a shark; I just need to outswim you.” Mark and I were quite a bit younger than Art, and we decided we could easily outswim Art. “That’s why I got a knife, I just need to stab you in the leg.” was his answer. That started the running joke of the season with Mark and me. While we were under water we would yell through our regulator loud enough to get the others attention, and then like gunfighters quick draw knifes on each other, it was usually a draw. If you know anything about scuba and how truly awkward all the gear you need to wear in the North Atlantic is, you would think this is pretty funny. In this case the shark is market innovation. Basically, each year the market gets harder. You hear it all the time, about how it’s harder in any given industry to make the returns. Be it from farming to software startup, each year the competition gets stiffer. Innovation is the primary driving force of the market and each year, the competition innovates and makes the value of today’s products worth less tomorrow. It’s why cars are getting better each year and the cost either stays the same or goes down or why my first PC cost $3k and my latest one costs $1k and it’s nicer. It’s why we hold off on that purchase, because it will be better (and cheaper) next year. It falls under the theory that in the long run economic profit will always drop to zero, be it in an industry or a company; economic profit will always equal zero over time. There is a whole bunch of economic theory in this that I am skipping over for the point of brevity, but the general theory remains the same. The point of business is to outswim the shark. You don’t have to be the best in the industry; you just have to be in the top half to make a profit. If there are 10 pizza shops in town, just make sure you’re ranking is not number six or below, and you get to make some money this year. The pizza shops in the last spots call it quits (get eaten) and new ones come to take their place and the game starts again next year. To outswim the shark you need innovation, because as you move forward what business practices you know today becomes common tomorrow. We all learn to swim faster, because we watch each other. In our overly simplistic example here: Our town has 10 pizza shops. Bob decides to mount big screen TVs in his shop so patrons can watch the game. His patrons like that, so he takes a few customers from all the other pizza shops. So now everybody needs to install TVs to stay in business. Steve decides to give away a free appetizer with each pizza, now everybody needs to do it. Because that’s what the market now expects, “I ordered a pizza, I want a free appetizer.” Of course each of these little things eats directly at the bottom line. This is where you need to innovate to continue to outrun the market. Better pizza, better service, free beer, whatever you need to do to outrun or at least keep up with your competitors. That’s where this gets hard, because whatever you think up this year, the other guys will do next year. That is the basic definition of market innovation. If you could measure this it would be the market innovation rate. I really don’t think there is a quantifiable way to measure this, but I know it would be different for every industry, for sure. Loosely, I would say it correlates to the inflationary index on an industry by industry basis, but that would be a messy assumption. If you happen to know of such an index please let me know, it would make for some fascinating reading. Just for the sake of argument, I’m going to say it’s 2% in our little pizza example. Which means, every year you stay in business, you need to increase your value proposition by 2% to retain your customers. That 2% is pretty significant, because it comes directly from the bottom line. Wiggle that number a little depending on how your costs play out, but it becomes significant over time. That’s why our pizza shop was making money “in the good ol’ days” but not anymore. It can no longer outswim the shark. To survive, you need to innovate at least as fast as the market and remain profitable while you do it. The basic term is you need to get better, faster, and cheaper. I make it sound so easy don’t I? Just succeed against ever mounting competition, all the while they are trying to succeed against you. This is of course why you have the big title, and I make no qualms to the complexity of the task. I of course cannot offer you any easy solution to the problem, but I can offer some small pieces of wisdom. You are fighting a very patient enemy, so be persistent about the details of your business. If you accept the loss of 1% to the bottom line this year, expect 2% next year unless you make some changes. Plan for the long haul, because shortcutting is a quick way to ruin. Make sure you get processes in place to have sustained gains. Every time you invest time and effort into your business make sure you take the steps to make it stick. Do the follow up, take the time to make sure everybody is trained, do your due diligence. Hire some experts (this is my sales pitch) because there is an opportunity cost every time you make and don’t make a decision. You have only two ways to increase your innovation in your company. Make it or buy it. If you cannot make a solution quick enough, go buy it. I have seen people lament for years over spending money on experts, just to find out the expert saved ten times as much as they cost. Spend the money and be done, plus save yourself the headache. Last but not least, execute the plan. Do the due diligence, hold the accountability, drive the pace, (whatever you want to call it) but say what you are going to do with the plan, and then follow the plan. There are about a thousand books on execution, whether you go get one is up to you, but I will tell you for fact that the number one reason plans fail is for lack of execution. You are the leader of your company—your small business—the responsibility of outrunning the market rests solely in your backyard. You cannot outsource it, you cannot delegate it, because you own it. If you look at the CEO of every Fortune 500 Company, you would see one their primary goals is to innovate faster that the market rate, whether it comes through cost cutting, restructuring, new designs, you name it. Everything is about innovating faster than the guy next to you. Not that they all succeed, but they know that if they want to stay in the Fortune 500, they keep trying. The same is true for you: if you want to survive, you must continue to innovate; it’s the nature of the beast. As the days grew shorter and diving season came to a close, Mark yelled through his regulator one last time. I turned and saw he already had his knife out, even though he had his regulator, I could tell he was smiling. He had figured out how to outswim a shark.